Some people will try and tell you that preseason games have no bite or sparkle. It is fair to say that these games are about developing fitness, confidence and team spirit but sometimes, there will be a lot more action involved than people would naturally think. If preseason games are meant to be dull, no one told the Washington Wizards and it may have left the team with a bit of a selection headache for the start of the regular season later on this month. The Wizards grabbed an 85-81 win over the Chicago Bulls but the main talking point came from the fact that four Wizards have now been suspended for the opening game of the 2014/15 season or at least the first competitive game where the player is available to player. 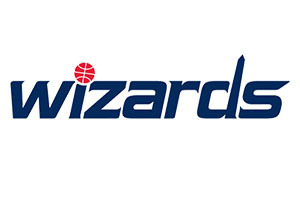 The four players who have been suspended are Xavier Silas, Daniel Orton, Nene and DeJuan Blair. 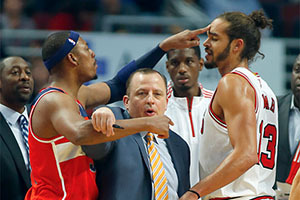 All four of these players left the bench to get involved in a scuffle that was taking place between Joakim Noah from the Bulls and Paul Pierce from the Wizards. The match took place on Monday and by Wednesday; the NBA was taking action, announcing the suspensions. There has also been a fine imposed on Noah and on Pierce, with both players set to be losing $15,000 from their pay packet thanks to being the instigators of the incident. The scuffle took place very early on the in the opening quarter. It seems as though the altercation started when Noah shoved Pierce with Pierce then retaliating by poking a finger towards Noah’s head. It may not have been the most terrifying of scuffles but it was still more than enough to get a lot of people, who should know better, hot under the collar. Before too long, Tom Thibodeau, the coach of the Bulls, had to get in between the two players to prevent the incident from escalating further. It’s good for TV, I guess. I don’t know what to say. It just happened. It’s not scripted, but it just happened. The league rules clearly state that any player leaving the bench will be subjected to a one match suspension and this is an automatic punishment, so there can be no cause for complaint about the punishment handed down. The league has the power of discretion to determine if the players violate the spirit of the game, but in this case, all of the one game suspensions stand. While the NBA may want to clamp down on incidents like this, it seems the Wizards were more than happy for the event to have taken place. It seems as though the scuffle and show of unity with their team mate wasn’t just to batter down the Bulls into submission, it was all about sending a message to the rest of the league that the Wizards are still very much in contention. With the Cavs springing to life once again with James back in the fold and Chicago being boosted by Derrick Rose returning and the capture of players like Nikola Mirotic and Pau Gasol, many people around the sport have predicted that these are the teams that will dominate the East this season. Clearly the Wizards don’t think that their achievements of last season are being afforded the proper respect and they look set to battle hard this year once again. This could be the setting for a good tussle in the Eastern and on the 29th of October, the Wizards will get started against Miami Heat. At the moment, the four suspended players will not be eligible but with a game on the 30th against Orlando Magic, it shouldn’t take long to get people involved if the coach decides that they are in his plans.